Charismatic hero Jack Steel returns, in a new and perilous adventure. England 1708 and Jack Steel returns to Flanders from England a married man. But his wife Lady Henrietta Vaughan is proving expensive and Jack must look for a promotion. At the battle of Oudenarde Steel is sent in to stem off the French attack and wins a glorious victory for Marlborough.The allies eyes' turn from Paris to Lille, where the Dutch have recommenced a siege. Unbeknownst to them, Marlborough sends Steel, his trusted envoy to Paris to broker a deal with a man who has the ear of the French King. 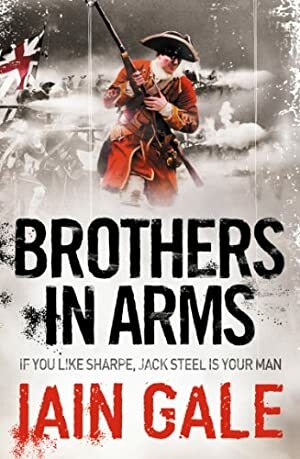 Disguised, in danger of exposure and in fear of his life, Steel accomplishes his mission and makes it back to the bloody, mud-logged siege of Lille - a victory for the British in the end, but at huge cost of human life. As Steel desperately tries to open supply lines to his troops, he discovers that his wife has been unfaithful to him, though he has risked all to rescue her from the besiged town of Leffinghe. Jack returns to England covered in glory from Lille, and with the promotion that he desired. Although he has lost his reason for desiring money and honour he is now even more determined to win further military accolades in order outshine his wife's new lover. Log In to track Iain Gale on eReaderIQ. to be notified each time the price drops on any book by Iain Gale. to stop tracking Iain Gale. We started tracking this book on April 25, 2014. This book was £3.99 when we started tracking it. The price of this book has changed 62 times in the past 1,820 days. The current price of this book is £3.99 last checked 3 hours ago. The lowest price to date was £2.48 last reached on December 17, 2014. This book has been £2.48 one time since we started tracking it. The highest price to date was £6.49 last reached on January 14, 2019. This book has been £6.49 one time since we started tracking it. We last verified the price of this book about 3 hours ago. At that time, the price was £3.99. This price is subject to change. The price displayed on the Amazon.co.uk website at the time of purchase is the price you will pay for this book. Please confirm the price before making any purchases.